It was my Husband’s friend, who introduced chicken stew to my house. Every sunday morning it was a routine for my husband and his friend to have appam and chicken stew from a hotel nearby to their hospital. When my husband finished his training and was back at home, he was missing his chicken stews very much. We thought of giving it an attempt ourselves and we were in search for the traditional recipes. We found so many recipes over the internet for chicken stew, but my husband was never happy with any of those preparations. Recently we got a recipe from his friend’s mother itself and it was an awesome one. We are sharing that preparation below. Clean the chicken pieces well, drain it and keep it aside. Prepare medium sized cubes of potatoes and carrots. Finely chop the ginger, garlic, onion, shallots and green chillies. In a large cooking pan, heat 3 tablespoons of coconut oil, add the spices (cloves, cinnamon star anise, bay leaves and cardamom) and stir for a few seconds to one minute. Reduce the flame and add garlic, ginger and green chilly. Saute it for few seconds and add the finely chopped onions (from step 3) – Keep sauteing and add a little salt. Lower the heat, when the onions turn golden brown and add ½ tsp garam masala and 1 tsp coriander powder. Stir for few seconds. Add chicken pieces, carrot and potato cubes, 1 sprig of curry leaves and ½ tbsp lemon juice – Keep stirring and lower the heat. Pour two cups of the thin coconut milk and mix well. Cook it covered until done and keep stirring in between. Add peppercorns / pepper powder when the stew is cooked and mix it well. Add the thick coconut milk and mash a few potatoes with a ladle to make the gravy a little thicker in low heat. Keep stirring and remove from stove, when it starts boil. In another cooking pan, heat 1 tsp of coconut oil and fry the cashews, raisins and add it to the stew. Fry the shallots and remaining curry leaves in the same pan, until shallots turn golden brown and put it as seasoning over the stew. 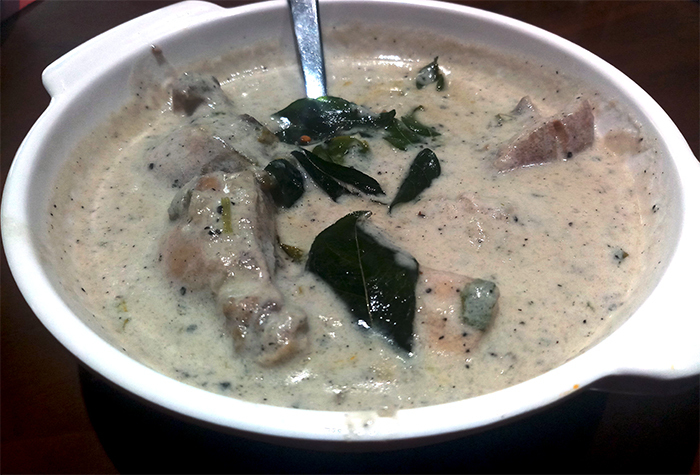 Transfer the chicken stew to a serving dish and serve hot with appam, idiyappam etc. Hope you will drop your comments and feedbacks after trying this recipe. This entry was added on January 20th, 2019 by Renoos in Non Veg and tagged with chicken recipes, stew recipes, chicken recipe, indian style chicken stew recipe, chicken stew with coconut milk, kerala stew, chicken, easy stew recipe, chicken stew curry recipe. Last revised on January 20th, 2019.